Stealth Cam offers to the hunters the revolutionized trail cameras. The brand pieced together those traditional cameras and put some other tools and made another up to date working trail cameras that fit in today’s generation. The company keeps on monitoring what is the best trend every year. In the year 2009, they introduced the first High Definition camera in the wild which shoots video clips with audio. In the year 2010, stealth cam brand presented another first in the market which is the 3-in-1 and named it TRIAD technology which means that hunters can use the trail camera in three ways; image camera, video camera, and time-lapse camera. 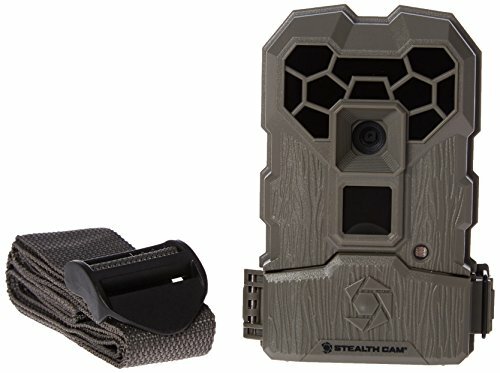 Up until today, stealth cam brand still produced up to date trail camera that makes hunters in the world feel the hassle-free in capturing the wildlife. Here are some of the game camera of stealth brand that will help you in choosing what are the best trail cameras for you. 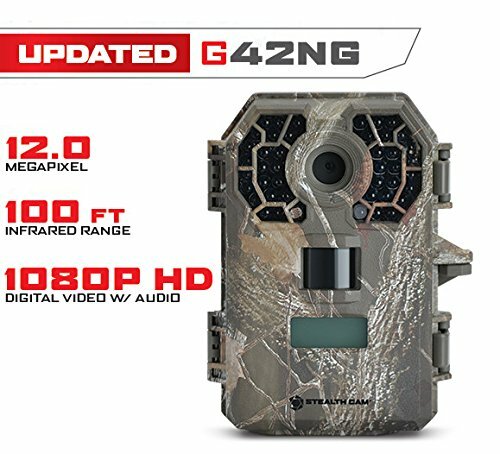 The stealth cam G42 no-glow trail camera captures 10-megapixel quality picture and a high quality five to 180 seconds video with audio. Nighttime uses require shorter video (10-30-seconds). It uses no glow technology and offers a variety of picture resolution which is the 8 megapixel, 4 MP, 2 MP and others. It has 42 black IR emitters that range 100 feet away. The model does not emit red light and some noise that may attract the animals into the wild and may disturb the activities of the animals. One of its features is the reflex technology which makes capturing photos even faster. You may have explicit pictures of you because the camera has a matrix blur reduction in it that reduces the blur of fast-moving objects. The model provides a multi-detection range that captures the animals in different angles and distance in the area. It has a rapid-fire burst mode that occupies one to nine images and has an automatic trigger of 0.5 seconds and 5-59 seconds of recovery timeout. It has a manual shot capability and secures your camera for it has a lock password protection in the SD card slot which accommodates up to 32GB. In every frame that is produced by the model, it indicates the time, date, temperature and moon phase in it. The STC G42NG also has a standard mini-b USB that you may plug into your computer for transferring files purposes. To use the G42NG you have to put 8 AA batteries in it. The megapixel digital scouting camera of stealth is a 6-megapixel camera that also has a video recording which has a maximum of 15 seconds. It takes colored frame daytime and infrared shots during nighttime. It has 12 IR emitters that reach up to 50 feet of the area. It has a burst-rapid fire mode that will take continuous shots of the animals from 1 up to 6 images after it was triggered by 5-59 seconds and recovers immediately in 1-59 seconds after it timed out. You may also know if it has already near its low battery for it indicates on the screen how many percents your battery is. It also has a durable 3-D camouflage housing that will disguise and will blend into your camera in the surroundings. The photos have a time date, and moon phase in every frame indicated in it. In setting and using the camera, it has an EZ dial programming and a quick set dial that ha s3 preset mode to make your lives easier in setting up and using the P16. You may also conserve energy in using the product for it has a power efficient design that will prolong and optimize the use of the camera and save time to check whether the battery is already dead. You may also download quickly what is in the camera for it has a USB output in it. The stealth camera G30 is an 8 megapixel and captures high-quality images of your wildlife activities. It comes with three resolutions which include the 8 megapixels and then 4 MP and 2.0 MP. It records video from 5 up to 180 seconds. The frames of the camera have a 16:9 image resolution setting. It has 30 IR emitters that cover 80 feet range of the area. It also comes with an automatic trigger of 0.5 seconds that will take videos if you are going to set it or photos whenever activated in 0.5 seconds. One of its features also is that it has a matrix blur reduction to minimize some unwanted blur that is caused by any movement in the area that will help you give more clear shots of the animals. The camera takes up to 9 photos every time it is triggered. It must have 8 AA batteries for your camera to be used. It has a manual shot capability, and you will be secured capturing the wild for it has a lock password protection in it and can accommodate up to 32GB SD Card slot. It comes with a test mode, video output, and a USB output. The stealth cam PX series game camera has a 30% brighter night imaging and is an 8-megapixel camera that captures photos day and night. It records videos for up to 15 seconds with a frame of 16:9 ratios. It comprises an 18 IR emitters that have a range of 50 feet of your area. It comes with an automatic trigger and a matrix blur reduction to make you so sure that it will not be blurry when the objects that trigger the camera is too fast moving. It also allows you to operate or run the camera on what hour you prefer it to activate for it has an active time setting. The PX18 camera has a burst mode that allows you to have continuous shots and captures 1- 6 images whenever it is triggered with 5-50 seconds and recovers directly in 5-59 minutes. In every picture and recorded video, it has an indicated date, time, and moon phase of that specific period for you also to best know what the behavior or habits and other things of the animals that you wanted to know are. In setting the camera, you can’t feel some hassle for it has three quick set modes that you can quickly tap into changing some settings. 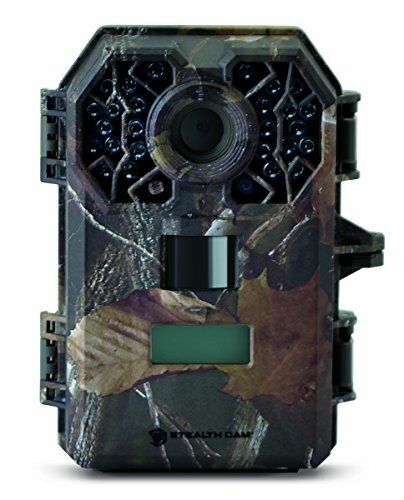 The stealth cam Trail camera or QS12 is a 10-megapixel camera that has a 60 feet range that will cover your wild area and activities. It captures up to 3 images and up to a 30-second video that you are going to take per trigger. After it captures frames or videos, it recovers immediately for 5-120 seconds after it timed out. 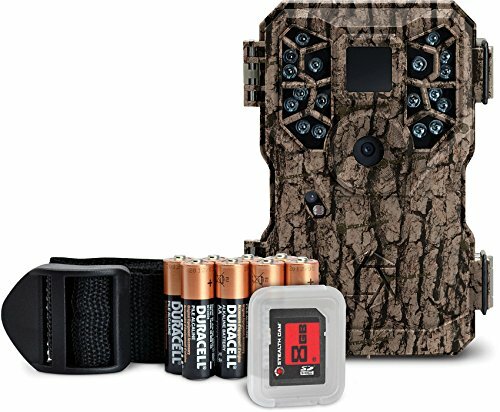 It only has a quick and straightforward set programming switch that will assure you to have no difficulties in using and setting up the trail camera. The QS12 can also save some energy for it is equipped with an energy efficient design. It also has a rapid-fire burst mode shooting that will take many continuous shots that makes you not left any single move of the animals in the wild. You may know if it is near the low battery for it has a small battery indicator on the screen. It is also armed with external LCD status display and a test mode that you can choose. For the external part of the QS12 trail camera, the SD card slot that the camera can afford to cater is up to 32 GB. It also has a mini USB output that you may connect it to some computers easily. To make the product power up, you must have to put 8 AA batteries in it for you to use the product. 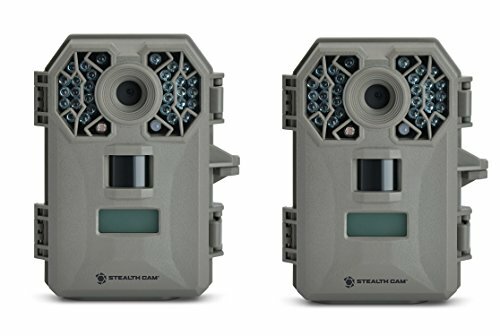 The stealth camera with compact scouting is a 7-megapixel camera capturing resolution and 18 IR emitters that range 50 feet. It can accommodate up to 32 GB of SD card to where all your records can be stored and can be enough for your photos and some video recordings of the area. You may also use the 4 GB SD card that is built into the camera. The P18 trail camera is also equipped with a 60-degree infrared range to make the nighttime photos decent enough even if there is no flash. The animals also can’t be disturbed even in the dark while shooting some videos or pictures. It also comes with a burst rapid-fire mode shooting that captures up to 6 photographs in a short succession per triggering. After it captures and records, it will automatically recover for 1-59 seconds after it timed out. When recording a video, you may set it between 1 -15 seconds. For the external part of a P18 trail camera, it is designed to be a weatherproof one that still captures and records no matter whatever it is in the wild. Can camouflage that can’t be noticed by any animals in the area and designed with a 3D tree bark coloring. If you wanted to transfer the files to your camera, you could use the mini USB port built into its design. It also indicates in the frame the time, date, and moon phase of that specific period it was taken. 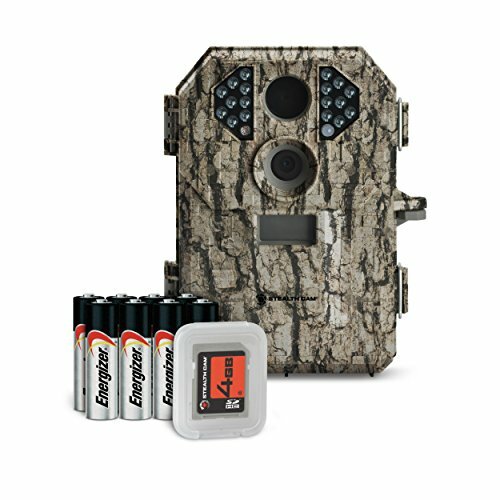 The Stealth Cam 45 No-Glow trail camera is a 14-megapixel camera that has four resolution settings that you can choose with, which are the 8 megapixel, 6 megapixels, and 2 megapixel high definitions that records video clips with sound. The high definition video can record 10-180 seconds and comprises with a Passive Infrared Sensor or PIR that detects speedy variation of infrared that can capture time lapses. It also has a rapid-fire burst mode that takes continuous shots for 1-9 frames per trigger. It can’t disturb and triggered the animals in the wild for the camera is equipped with 45 No infrared glow emitters that with up to 100 feet unnoticeable flash range. The product triggers within 0.5 seconds for both day and night frames and recording videos. You may capture any fast moving animals in the wild without blurry pictures for it has an advanced blur reduction. It consists of multi-zone detection that covers numerous areas of every angles and distance, and every frames it capture it produces 16:9 images that are wide enough for the screen format that extends the field of view. You may also use the captured photos for documentation for it consists of Geo-tagging that will locate wherever your cam is placed with optimal GPS tagging. You can also save the battery life of the camera for the product has an energy-efficient design that will optimize energy efficiency and prolongs the life of the battery to extend the use of the product. 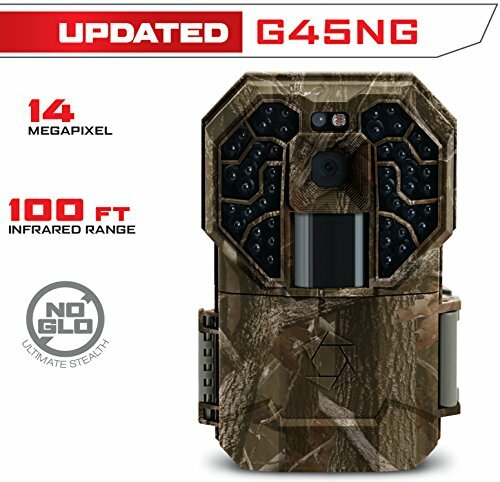 The stealth cam G42NG No glow trail game camera is a standard shot capability and has a 10-megapixel camera and four resolution settings including the 10 megapixel, 8 megapixels, 4 MP and 2 megapixels. You can have decent daytime photos and videos as well as during nighttime for it has a flash. The flash is no ordinary for it is 42 black flash IR emitters with up to 100 feet of range and it comes with an automatic trigger of 0.5 seconds. You can also take continuous shots for it has a burst mode that captures up to 9 images every time it is triggered. The stealth G42NG NO glow cam has three distance and angles, which are the short full angle zone, medium zone, and the narrower more extended distance detection zone. The recorded video is produced in a high definition and will document from 5 up to 180 seconds, and it comes with an audio and a time-lapse function powered with a Passive Infrared Sensor or PIR in it. You can also be sure that your data are safe for it has a secure lock password that is built in in the SD card slot (the SD card slot can be up to 32 GB). It has an image info bar where every frame has an indicated time, date temperature, moon phase and programmable camera name showed in it. You can also experience the tagging function of the camera for it is also equipped with a geotagging mode that will let you know the optimal location information of the photo using the GPS. To power, up the camera, you have to put eight alkaline or lithium AA batteries. 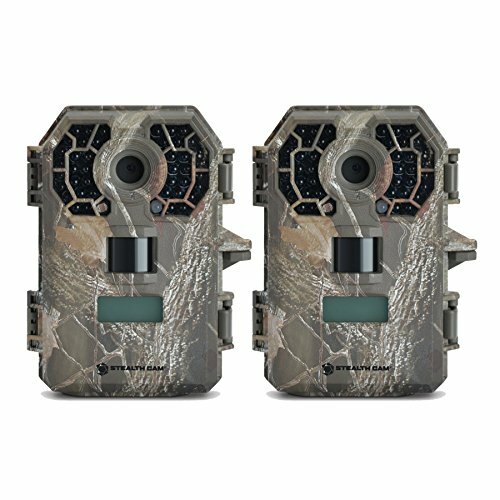 The Stealth cam 26 IR camouflage trail camera has an 8 megapixel that comes with two other resolutions, the 4 megapixels and 2 megapixels that you can choose. The triad 3-in-1 technology includes the high definition video, quick set-fast simple set up that will make you in using and setting up the camera so easy without problems and the burst rapid-fire mode. It records high definition photos and videos with 5 up to 180 seconds with audio. Can also capture continuous shots for it has a broken rapid-fire style. It is also overridden with passive infrared sensor (PIR) that will sense some fast-moving animals in your area. Through PIR, you may know what happened every day because the camera can capture time lapses all day and night with a less than 1-second reflex trigger. The camera also comes with a 26 IR emitters that range up to 70 feet, and you may capture pictures with no blur for it has a matrix blur reduction that reduces the blur in capturing photos. It also camouflages to whatever environment you are going to put the camera. 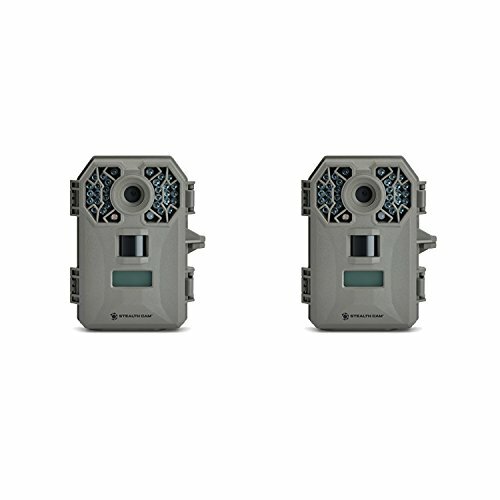 The stealth 26 IR trail camera also comprises of retina excellent low-light sensitivity and multi-zone detection that can detect many angles and distances that can cover. You can even get some information and document the frames of the animals because there is also a geotag that will indicate the geographical data of the photos that were taken. You can even make sure that the data and photos are secured for it has a digital lock protection for the security. 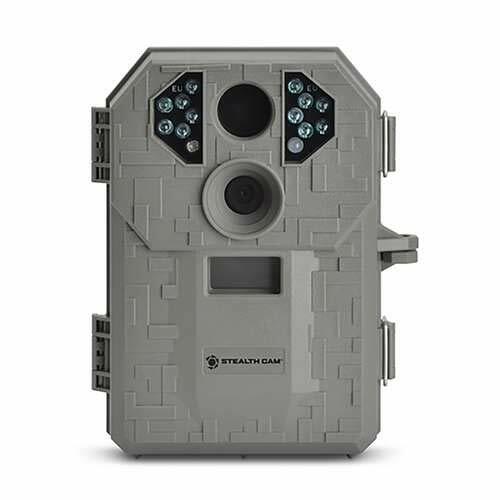 The stealth cam 26 IR trail camera also has an energy-efficient design that will help conserve and optimize the energy consumed and prolonging the use of the camera. The stealth cam G30 Digital scouting camera is an 8-megapixel camera and also comes with two other resolutions to choose: 4 megapixels and 2 megapixels. It captures high definition video recording from 5 up to 180 seconds. The camera incorporated of a sensitive sensor with 30 IR emitters that range from up to 80 feet through an automatic trigger that triggers 0.5 seconds. You may have frames without blur since it has a matrix blur reduction that decreases the motion blur of every pictures and video. It has a burst mode that takes continuous shots of up to 9 photos whenever triggered in 5 to 59-second delay. Time-lapse is also achievable for it has a time lapse function through PIR that helps detects fast-moving animals in the area. Every frame indicates the time, date, moon phase and temperature for that specific time it was taken. It has a low battery indicator that will help let you know whenever it is time to change the camera’s battery. It has an SD card slot that can only accommodate up to 32 GB, a USB output to connect to file transferring the photos or videos, test mode and a video output available. External power jack for 12 volts battery box is also available in the camera. To power up the camera for using you have to put 8 AA batteries in the battery section. You can make sure that the data are safely stored for it has a lock password in it for some security and privacy purposes.